Antelope Valley Indian Museum State Historic Park is California's State Regional Indian Museum representing Great Basin Indian Cultures. The exhibits and interpretive emphasis are on American Indian groups (both aboriginal and contemporary) of the Southwest, Great Basin, and California culture regions, since Antelope Valley was a major prehistoric trade corridor linking all three of these culture regions. The museum contains the combined collections of founder Howard Arden Edwards and subsequent owner Grace Oliver. A number of the cultural materials on display are rare or one-of-a-kind objects. The museum was originally constructed by homesteader/artist H. Arden Edwards in 1928. 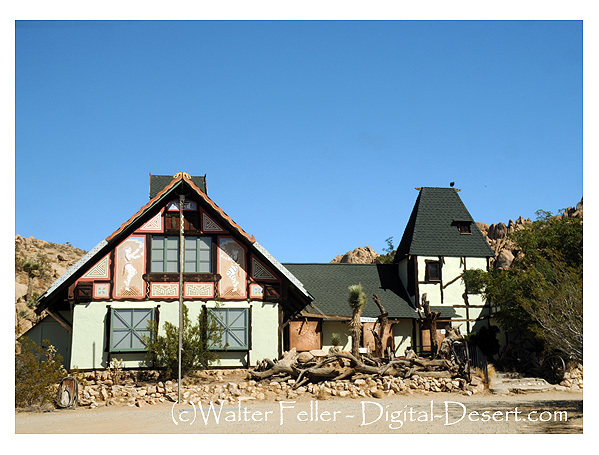 The chalet-style structure was built over an entire rock formation of Piute Butte in the Mojave Desert. The unusual folk-art structure is listed on the National Register of Historic Places. The museum offers the visitor a unique experience. The museum is located in northeastern Los Angeles County. It is 19 miles east of the Antelope Valley Freeway (State Highway 14), at 15701 East Avenue M in Lancaster. Go East on Avenue K to 150th Street East, go south on 150th for 2 miles. Turn left on Ave. M, and go east for 1 mile to the museum. Or exit Pearblossom Highway (State Route 138) at 165th Street East and travel north. Bear right as 165th turns into 170th Street East. Continue north on 170th to Avenue M. Turn left on Avenue M, and go west for 1 mile to the museum.